Organic traffic can generate huge returns for your business, so it's important that your SEO is on point. With DashThis, you can keep an eye on your search engine analytics so that you run an effective SEO strategy, all in one online SEO reporting tool. There a few tools you can use to track your search engine optimization efforts: Google Analytics, Moz, Google Search Console, SEMrush. The good news is we support all the major ones. All you have to do is integrate your favourite reporting tool and we'll take care of the rest. No more retrieving and collating data from different sources! Page views, search ranking, bounce rate, organic search traffic, conversion rate, site speed, click-through rate - there's a lot that goes into making sure your web pages are optimized. Get your SEO data working for you with our preset widgets (or you can create your own custom widgets) so you always stay on top of your SEO metrics. Our analytics reports are fully customizable from the dashboard right down to individual widgets. You can use on of our preset templates, customize the template or create a report from scratch. You can also add your own logo, comments and create custom reports so your analytics data is displayed just the way you want. Our aim is to make digital marketing reporting as quick and easy as possible. From Google Analytics to Moz to Google AdWords to SEMrush, we support all the major SEO tools you're already using to monitor your SEO efforts. You can also integrate your other digital marketing tools you're using for PPC or social media so that all your online marketing data is in one convenient dashboard. We have over 5900 users in over 70 countries who create thousands of SEO reporting dashboards every month for some of the top brands around the world. Our reporting software is backed up by stellar customer service and support so it'll be as easy as possible to create your web analytics reports. 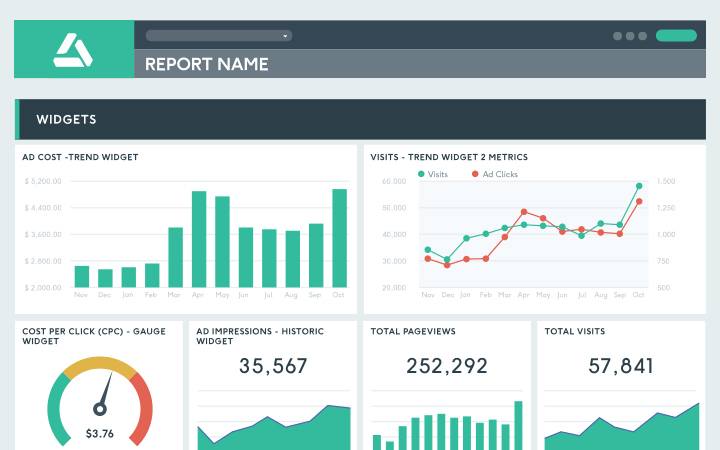 DashThis has all the features you'll need to create powerful SEO analytics reports. Our aim is to keep the reporting process as simple as possible. You'll get all the benefits of a real-time customizable reporting tool along with dedicated customer support. Customer satisfaction is our number one priority and we do everything we can to ensure using DashThis is a fantastic experience. Sounds pretty good, right? Think about how much time (and money) it takes your team to produce your SEO reports. Imagine saving that time and money instead. Well, that's what WE do! With the extra time, your team can add even more value to client projects, which means bigger profits! More time and bigger profits? We'd call that a win. And with our first-rate customer service, you aren't just getting SEO reporting software, you're getting peace of mind! Replace the standard DashThis URL with a custom one that matches your company (reports.yourcompany.com maybe?). Get a report with a custom design that reflects your company's fonts, colours and overall vibe. Save on a custom URL and design with a white label bundle that includes both! An SEO analytics report just the way you want! Your client's website probably involves a whole lot of data you need to keep track of. Our SEO analytics report template lets you gather all your client's website data into a single comprehensive report. No more inputting numbers into Excel or gathering data from multiple sources - once your report template is set up we do the data fetching for you. Our blog is always a great place to find tips of the reporting trade, as well as information on our product and updates. You can also follow us on social media to get latest info!